If you really want to understand what went wrong in America, turn off Fox News. Turn off MSNBC and CNN, too. Also, step away from the internet, unless you're using it to reserve tickets for Lynn Nottage's Pulitzer Prize-winning drama, Sweat. Set in a working-class bar in Reading, Pennsylvania, a factory town with little else in the way of opportunity, at the moment when the North American Free Trade Agreement allowed factories to suppress reliable wages, make unions virtually pointless, and move to Mexico if labor demanded too much in pay, benefits, or safety regulations. In the same moment, NAFTA wrecked the Mexican farm economy, pushing more immigrants to cross the U.S. border looking for work and ramping up a whole other set of anxieties. Sweat introduces us to "the regulars": good ol' boys and gals who all work or have worked for the factory. Most of them are second- and third-generation employees and visit their neighborhood watering hole to celebrate little victories and drown defeat. Their nightly conversations and struggles show how easily economic anxieties transform into racial anxieties. Sweat touches on the gutting of American labor unions and the factory floor roots of the opioid crisis as workers combat tedium and both physical and emotional trauma. Sweat focuses primarily on the lives of three female drinking buddies and two of their sons, all of them legacy factory workers. In a heated moment, something terrible happened, making everyone unrecognizable to one another. Nottage's play is like a weather forecast. She maps the converging pressure systems, as the storm rages harder and harder. While "Darkness at the Edge of Town," might make a good alternative title, with heavy doses of Springsteen and a sample of Billy Joel's painfully honest 1982 hit "Allentown," Sweat's sound design is sometimes a little too on the nose. 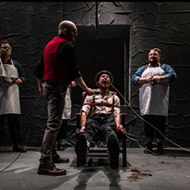 Otherwise, director Irene Crist's production for Circuit Playhouse is as rough and right as rolled up flannel sleeves, showcasing strong performances full of heavy hitters like Greg Boller, Jai Johnson, JS Tate, Tracie Hansom, and Kim Sanders, to name a few. If you're the sort of person who only sees a couple of shows a year, make this one of them. Sweat runs through February 17th at Circuit Playhouse. A long time ago, every member of the Tuck family drank from a hidden forest spring and became immortal, but each one is forever stuck with all the tropes of their frozen age. The parents manage middle-aged ruts and middle-aged spread and snoring marital monotony. Lost love burns like it can only in youth. Teen angst and pimples also last forever. Neighbors also tend to notice when you never age, so be careful what you wish for, and all that. 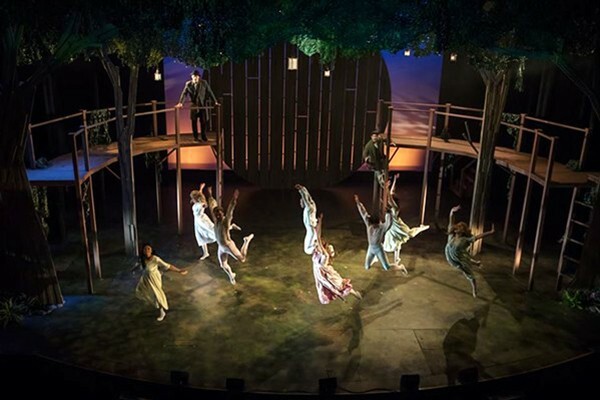 For Tuck Everlasting, Director Dave Landis has brought together a terrific cast, and his design team has outdone itself, building a world of green parsley stalk trees and purple "magic hour" skies, where a big round sun (or moon?) is eternally stuck in the rising — or maybe setting — position. Gia Welch's voice has never sounded as rich or full or uniquely hers as it does in Tuck. Even though she's a little too old to convincingly pass for an 11-year-old, her performance as Winnie is never anything short of winning. Welch leads a tight, talented ensemble of local favorites, including Michael Gravois, Lorraine Cotton, and Kent Fleshman. Even if you don't emerge from the theater able to remember the words to any of Tuck's songs — a distinct possibility — the voices follow you home. 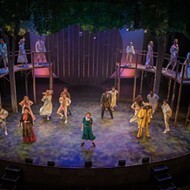 Tuck Everlasting runs through February 9th at Playhouse on the Square.